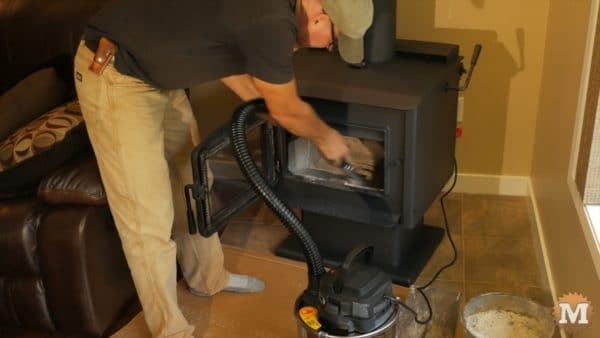 Ash Vacuum Review with Chimney Sweeping, Wood Stove Cleaning, and Fire Starter Making. 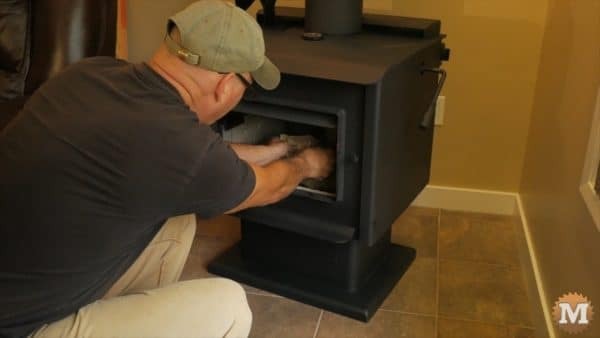 Time to get the wood stove ready for winter. 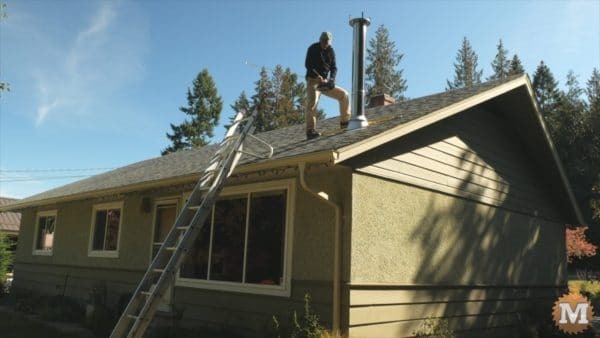 We have a high-efficiency wood stove and need to sweep the chimney of creosote and clean the ash buildup inside the stove. 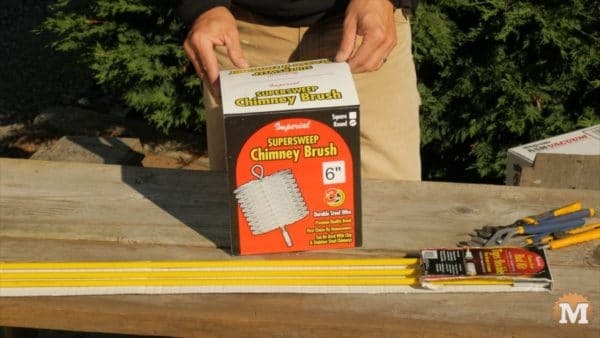 This year we tested a new chimney brush and flexible rod kit along with an ash vacuum by shop-vac. We also made fire starter bags from chainsaw wood curls. 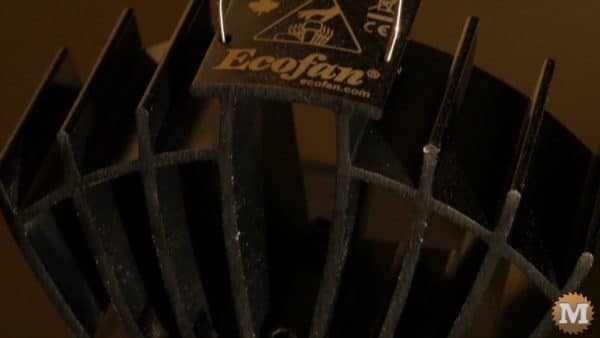 And we highlighted a wood stove fan by EcoFan. 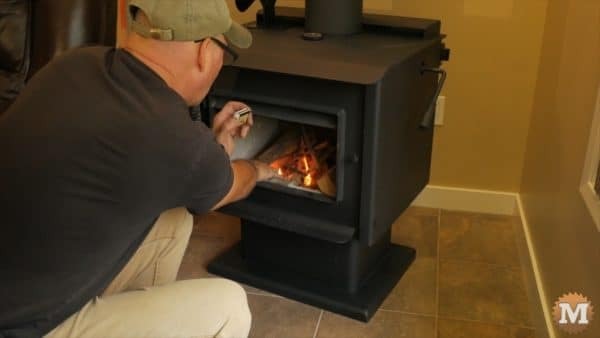 Last fall we had our wood stove upgraded to I high efficiency, long burning model: the Blaze King Sirocco 30 catalytic stove. 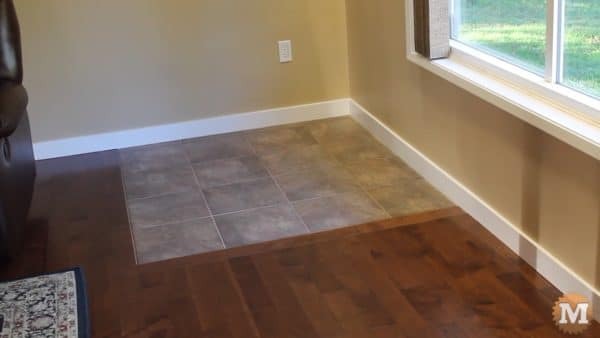 In a corner of our living room I removed a section of the hardwood floor and installed ceramic tiles. 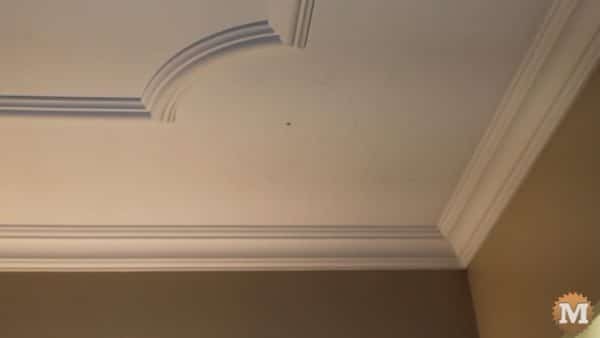 The ceiling of our living room has some nice decorative trim that may have been original from when it was built in the 50’s. 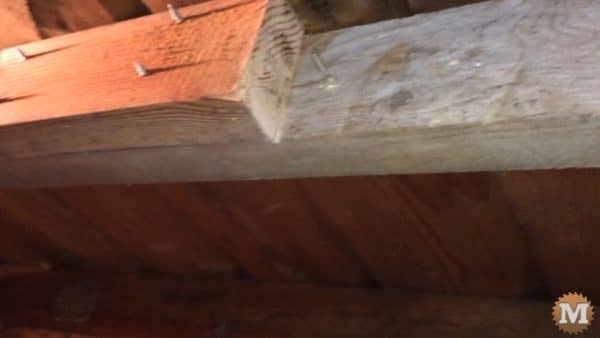 In the attic I sistered a rafter then removed a section of the original to make adequate clearance for the chimney. 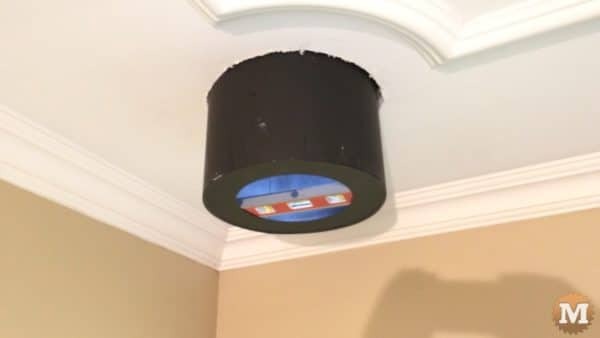 By removing a section of that rafter, the stove pipe could be lined up right at the centre of the curved trim. Which I thought would look pretty nice. 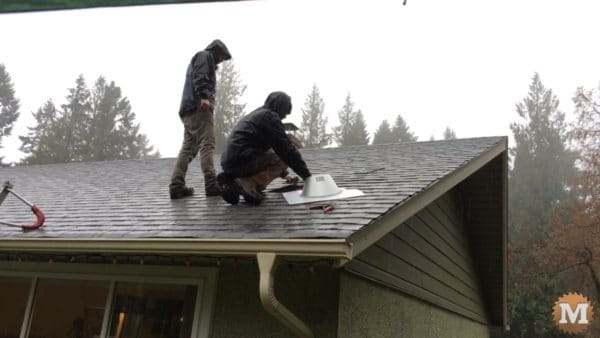 Our local wood stove dealer and his crew came on a very rainy afternoon last fall. 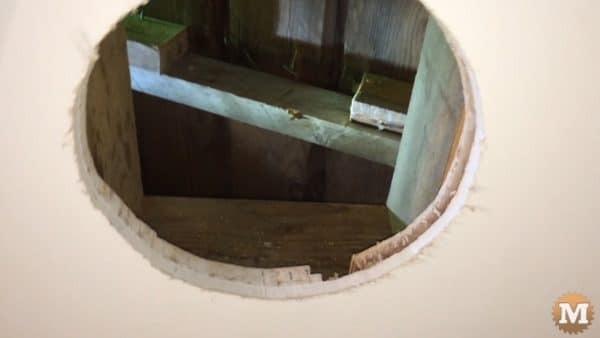 Then outside on the roof they cut a hole and installed the rest of the chimney. Not a fun day from them as it poured rain all day. 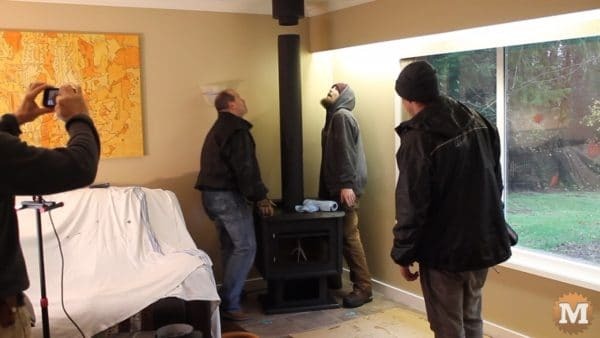 The three of them brought the wood stove in on a dolly, then set it in place. And connected the stove to the chimney. 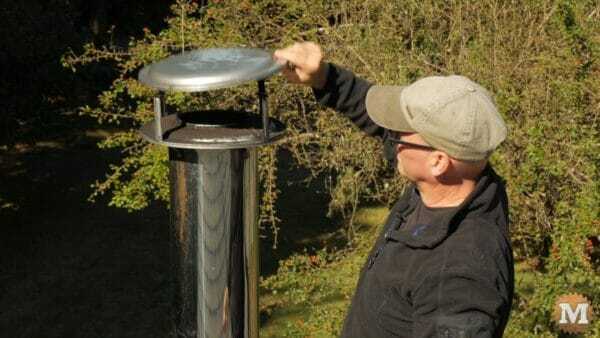 They did a great job and this stove kept our little house warm all winter last year. 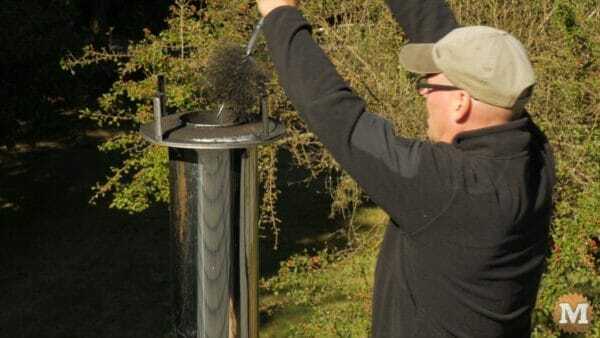 During that season I cleaned the chimney with a poly brush on a long and awkward metal pole. I used a shovel and steel pail to clean out ashes from the stove. 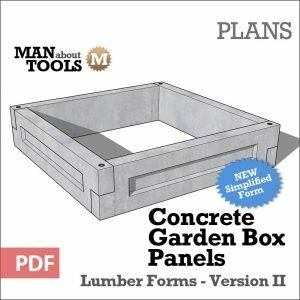 This year I decided to make this task a bit easier. The poly brush I was using was too tight in the stove pipe and made it difficult to sweep. I decided to go with a 6″ steel brush, and instead of the long metal pole I wanted to try a three piece flexible rod set. 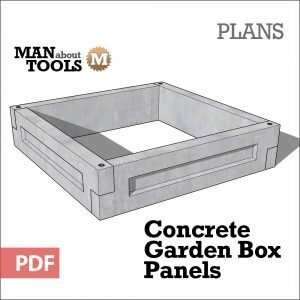 They screw together easily and tighten with two wrenches. As you are sweeping you can add more lengths of rod as you go along. 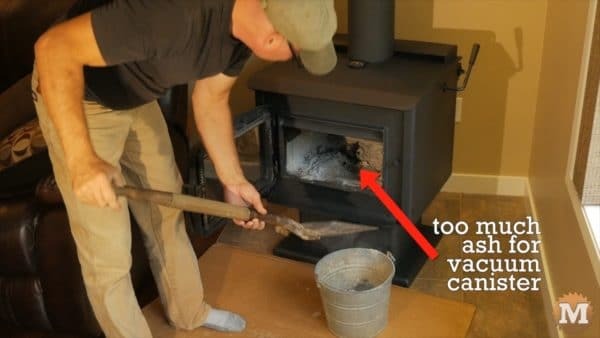 I find the high efficiency stoves create more creosote buildup so I wanted to try out an ash vacuum to make stove cleaning a bit easier and less messy. 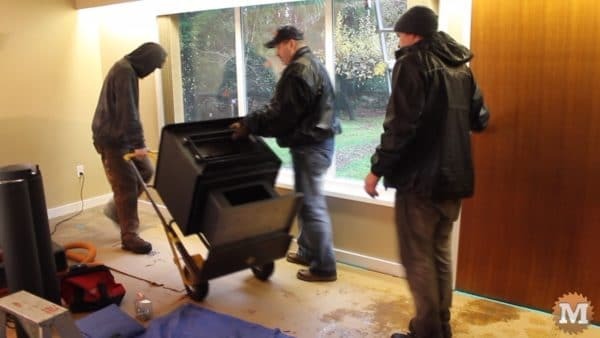 I decided on the Shop-Vac model as I have other Shop-Vac products and find they are reasonably priced, work well and it’s easy to find replacement filters. 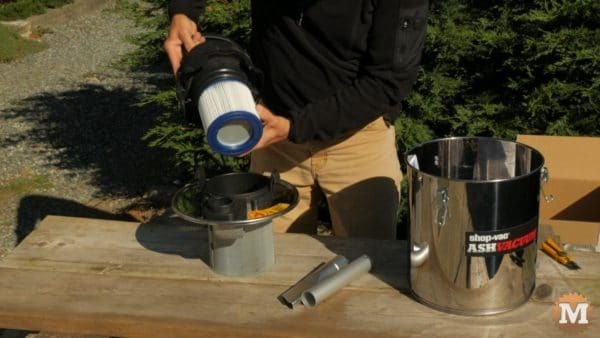 This vacuum has a stainless steel tank, a HEPA cartridge filter, a metal pre-filter, and a 6 foot power cord. 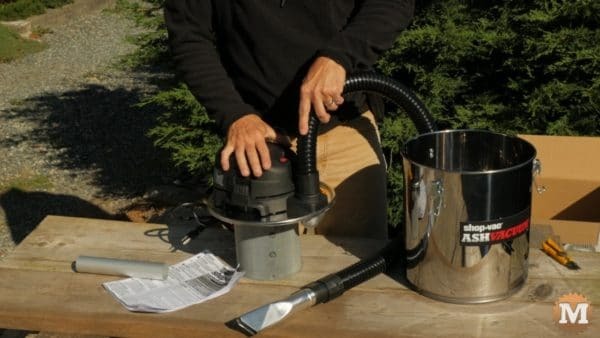 The 4 foot hose is vinyl covered flexible steel with a round metal nozzle and crevice tool. And the hose locks into the motor housing. The motor is rated at 6.3 Amps. 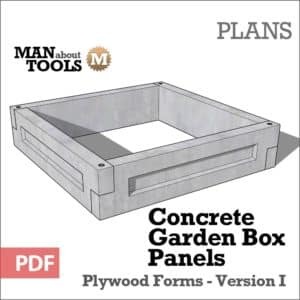 As we are heating the house with wood and we need a wood drying and storage shed as close to the wood stove as possible. 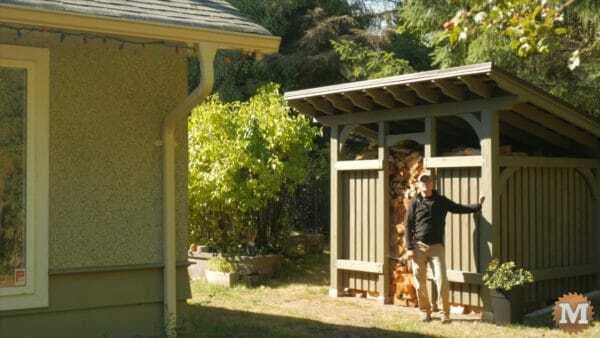 There’s a perfect spot right beside the house that has easy access through the front or back door of the house. It’s also close to the driveway for easy loading. 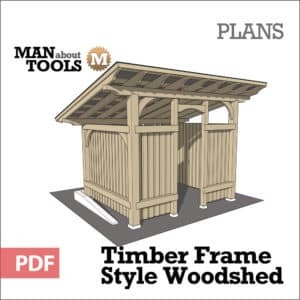 Last summer we built this timber frame style woodshed. 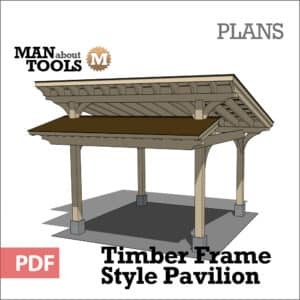 See the complete build video and download the plans. 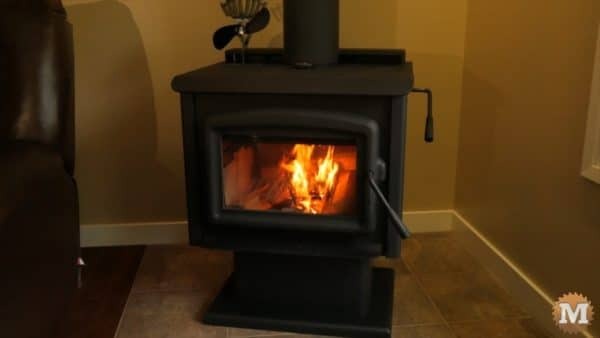 My wood stove has a bypass handle that you engage when the stove reaches a temperature that the catalytic converter runs at. 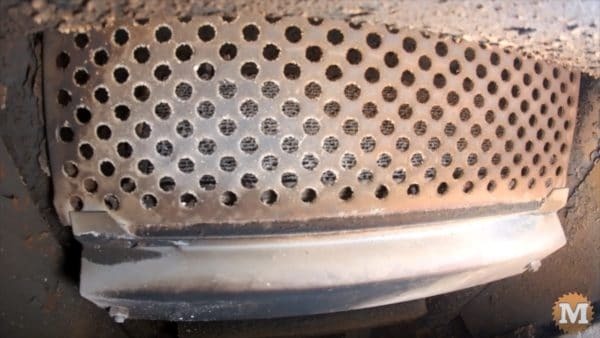 This handle closes a door for the stove draft and directs the smoke and hot gasses through the fine honeycomb-like metal mesh that is the catalytic converter. Before sweeping the stove I turn this handle to make sure the door is open and the creosote flakes fall into the stove and not pile up against the door. Up on the roof I remove the four screws that secure the rain cap. 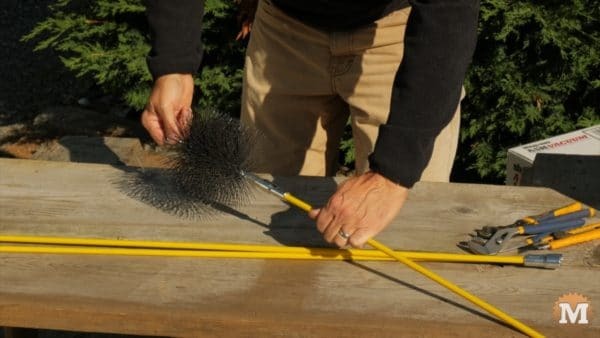 Then I insert the round brush into the chimney and run it up and down and lower and lower toward the stove. 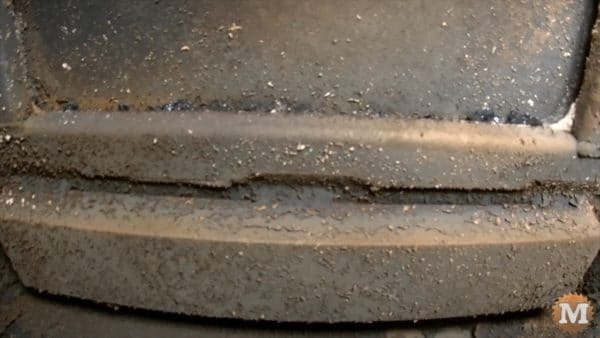 This flakes off the hardened creosote deposits so they can fall down into the stove. 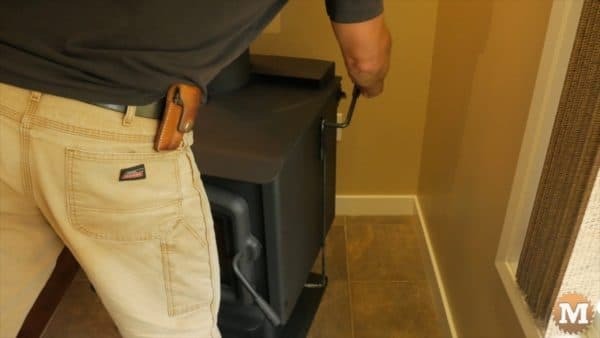 I then add another rod and continue doing this until I reach the stove. When done I pull the brush up and out then scrape the underside of the cap to remove any deposits on it. The cap gets reattached and this part of the job is done. 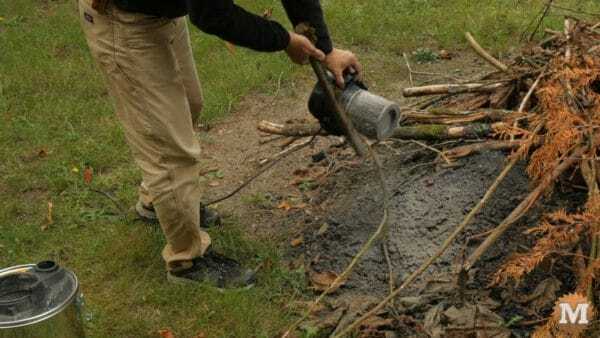 I remove most of the ashes with a flat shovel and steel pail, going slowly to not stir up a lot of dust. Now to try out the vacuum. I get most of the leftover ashes. And then take a brush to the inside to break off or loosen any creosote and soot. Then vacuum again. The flexible hose helps get the ashes right inside the door that’s hard to get with my shovel. 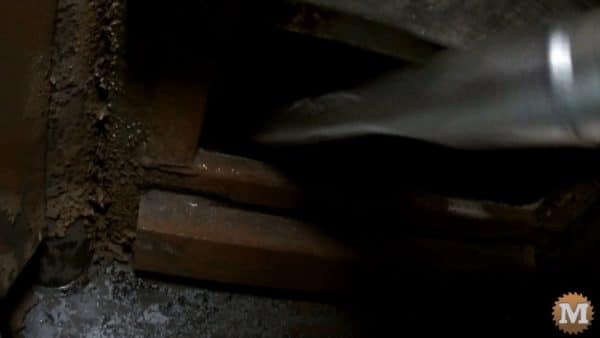 The crevice tool helps get some creosote that fell beside the bypass door. The ashes in the pail I sprinkle over one of our long-term compost piles. 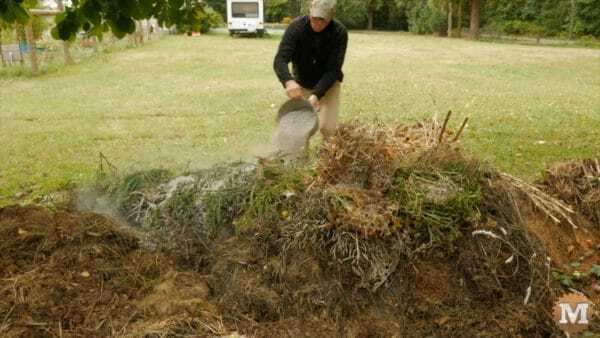 It will all be worked in when the pile gets turned and aerated. The ash vacuum is disassembled and the mostly creosote and ash mix I add to a small burn pile in the back. The metal pre-filter comes clean by tapping it. I do the same with the HEPA filter to clean the ash dust off best I can. I’m very happy with this ash vacuum. It does exactly what I need it to. It small and lightweight, well built, and has plenty of power. I didn’t notice any loss of suction as I vacuumed and it’s pretty easy to clean. I have some cedar rounds left from milling lumber for the woodshed build. These have few knots and are straight grained so I put them aside to split into kindling. 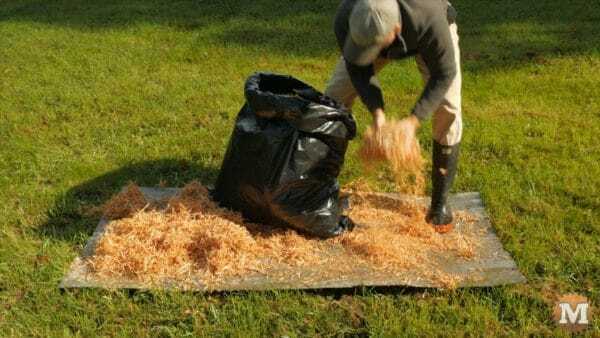 We also make fire starter bags from the chainsaw wood shavings. 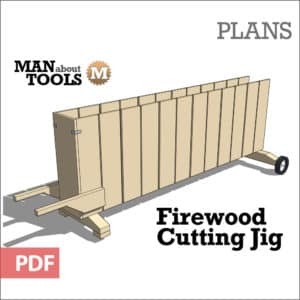 I’ll start by cutting this round down to about wood stove length. 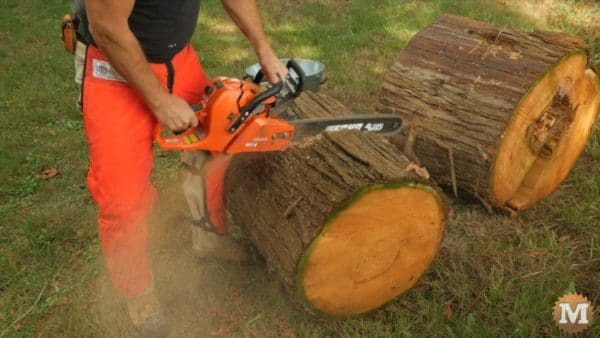 Then I’ll make a few rip cuts half way through the log. Cutting this direction, with the grain, produces long thin curls. 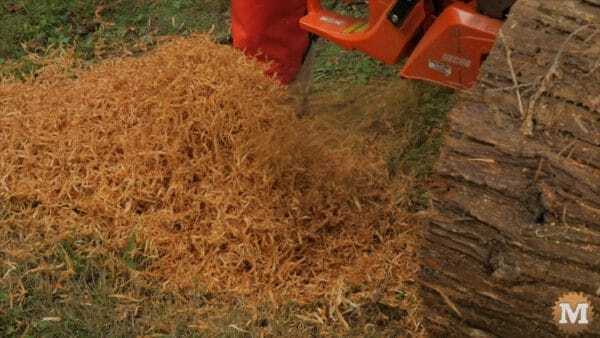 These shreds pile up quickly and it’s not long before I get several pails worth. 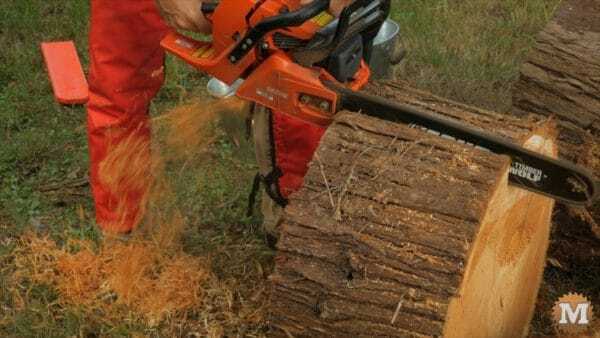 Cedar is ideal for this but spruce, pine, fir , or any softwood would work fine. I spread these shavings on some scrap tin roofing and let dry in the sun for a few days. Then I store them in garbage bags for use later. Here’s some dry fir shavings from a tree that came down last summer. 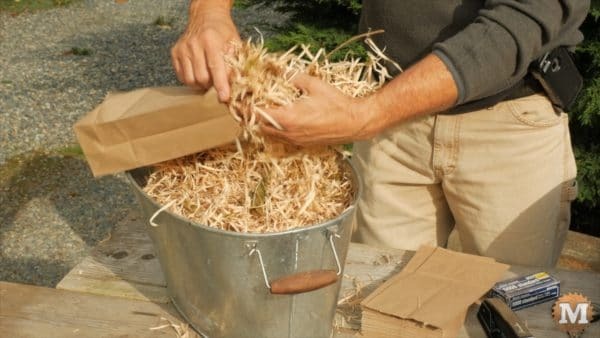 To make the fire starter I use paper lunch bags, a stapler, standard office staples, and scissors. 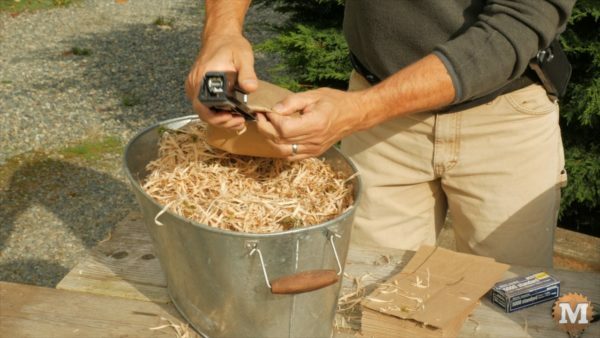 I loosely stuff the bag about three quarters full of shavings, fold the edge over, and staple shut. I enlisted the help of my wife Marilyn and in only a few minutes we stuffed and sealed about 20 bags. I store them in boxes in a dry place near my kindling. 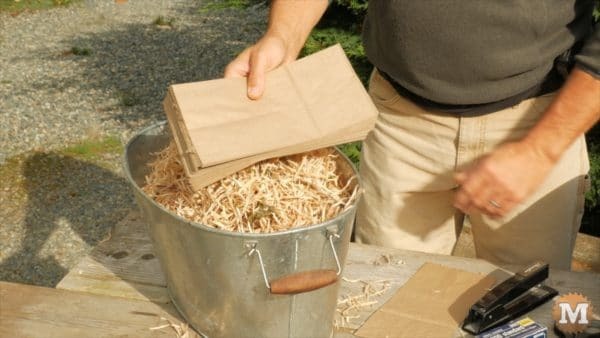 I tear a bag open inside the wood stove and add kindling on top. The bags keep everything tidy. Tear them open inside the stove. The shreds are easy to light and the bag keeps it tidy. 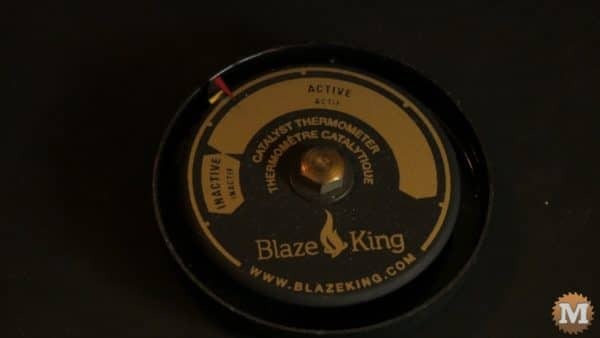 When the stove reaches the Active Range on the Catalyst Thermometer, I close the bypass door directing the smoke and hot combustion gases through the catalytic converter. I set the air intake dial to about 3/4 open and the stove regulates the burn to maintain a consistent temperature. When running like this there’s very little smoke generated and we get very long burn times. We have a fan that circulates the warm air and pushes it into the room. 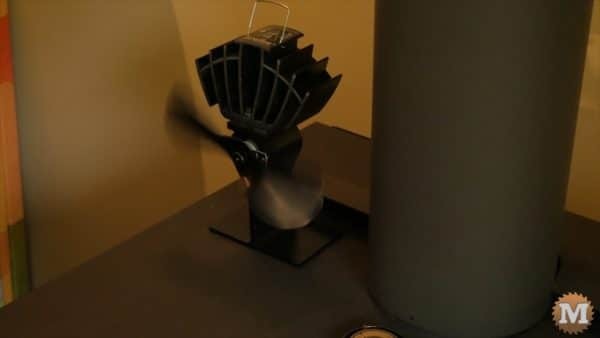 This fan needs no power source as it generates an electrical current on it’s own when the stove heats up. 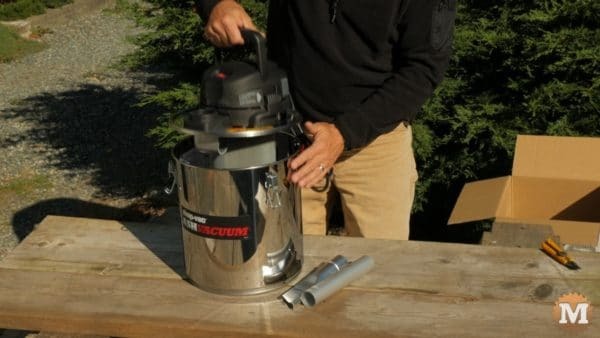 The temperature difference between the base that contacts the stove and the cooling fins generates a current. It’s very cool. 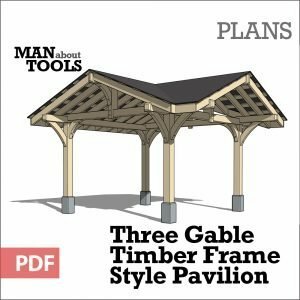 Thanks for reading this post. And… please subscribe to our channel if you haven’t done so already. Stay warm everybody!